Devil May Cry (DMC) 360 Review. Overall DMC is a great reboot, probably the best reboot that I can think of in game industry. Dante is back, but not as you remember. You play as the half angel, half demon, lean mean fighting machine Dante, the only being on earth that can kill Mundus the Demon King. But why the hell should you care? Well that SOB killed your mother and imprisoned your Dad! So screw that, he is going down. With a fantastic cinematic opening, full of babes, guns and alcohol we get to know what has changed in the all-out, no holds bar reboot. Dante isn’t exactly how we remember him. He’s been completely updated, gone is the white hair red coat, the Japanese Manga feel; replaced by a stylistic modern day look and an updated fashion sense. Dante is bad arse, he doesn’t care about anyone except for himself, I mean, why would he? He doesn’t know his parents, he doesn’t have friends it’s just him and his handguns ‘Ebony and Ivory’. Dante, the one liner so called hero, lives for himself until his world is literally turned upside down by a mysterious girl known only as “Kat” who tells you of Mundus the demon king and the terrible things he did to your family. 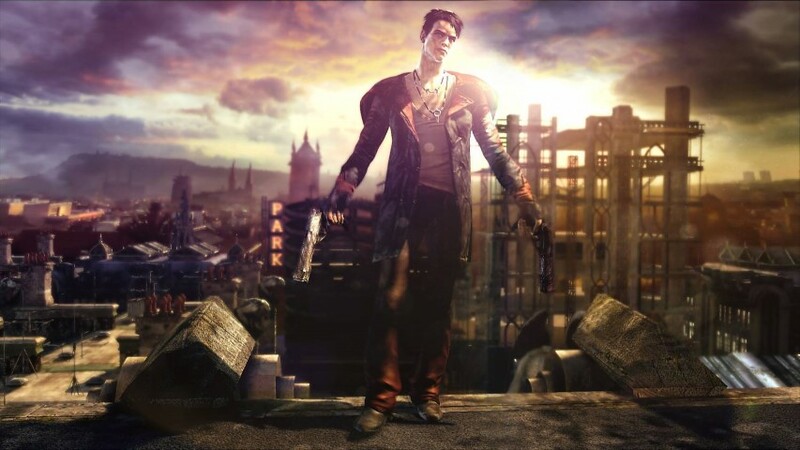 Mundus controls the city by fuelling the population with a Coke type drink that is spiked by a drug that makes anyone that drinks it docile and just like Coke that means everyone but Dante is borderline comatose. Kat guides you in to a realm known as Limbo, where demons roam free and go unnoticed in the human world. You need to a hunt down Mundus and slaughter anything that gets in your way. 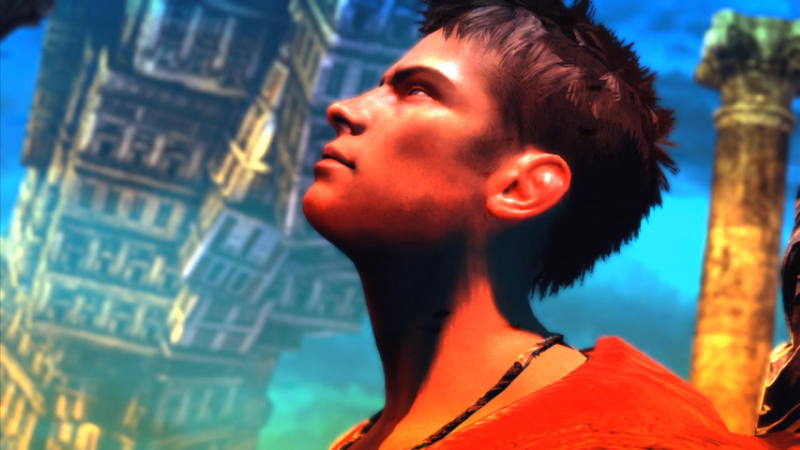 The graphics in DMC are something of spectacular, just like most games that come out at the end of a consoles life, but Developer ‘Ninja Theory’ has truly raised the bar. Character skins are almost Hollywood animation quality, the games dynamic lighting and smooth pixels really impress the eye. Pair this with the stylistic world of Limbo and you get a game that looks better than anything on the market. Fluid cut scenes let you immerse yourself more into the story rather than going to load screens. This has worked well with titles like Uncharted for the PS3 and it is no different here! Dialogue in video games usually comes off as wooden and feels like the voiceovers are delivered by manikins. They make Hayden Christensen look like a good actor. 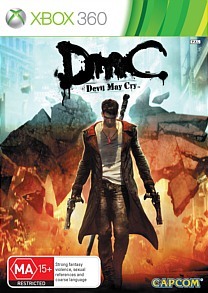 DMC flattens the competition and consists of a movie quality script, and great acting from Aussie new comer Tim Phillips. He shines as Dante, he makes cut scenes feel like they were made by a Hollywood director rather than a bunch of fat dudes behind a computer. Dante is cocky, witty and funny. Arcade gameplay is always likable. It allows for anyone to just pick up and play DMC. The levels are long enough to allow a quick, yet fun session when you only have enough time for when the wife is in the shower. Yet, allow for longer sessions when you want to get every achievement in the book. While playing these styles of games it starts to become clear that the fighting just becomes repetitive it's an all-out button mashing marathon! Most enemies are similar in skills making them for simple cannon fodder. That’s where the arcade pickup and play style becomes useful, it might just be me, I get over the same gameplay when it doesn’t change. While the game does offer a boss battle in most missions they are just few and in-between. Combos are one of the best things this game has going for it. 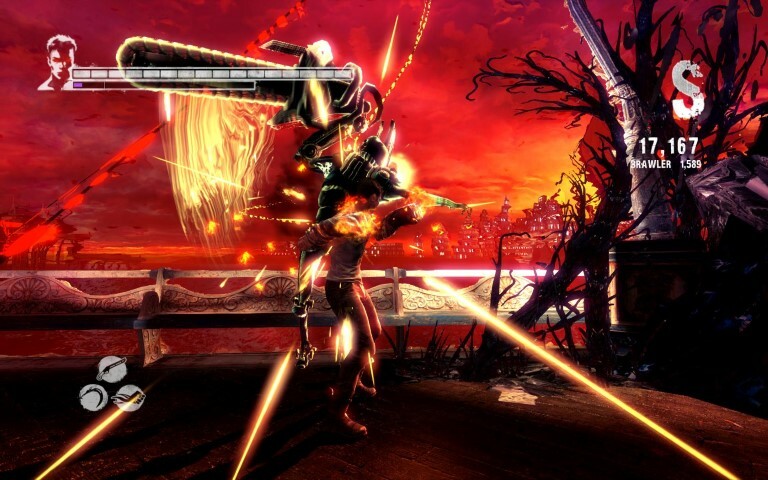 DMC has the hack and slash game play down to a tee. You can jump from demon to demon with the numerous weapons at your disposal. 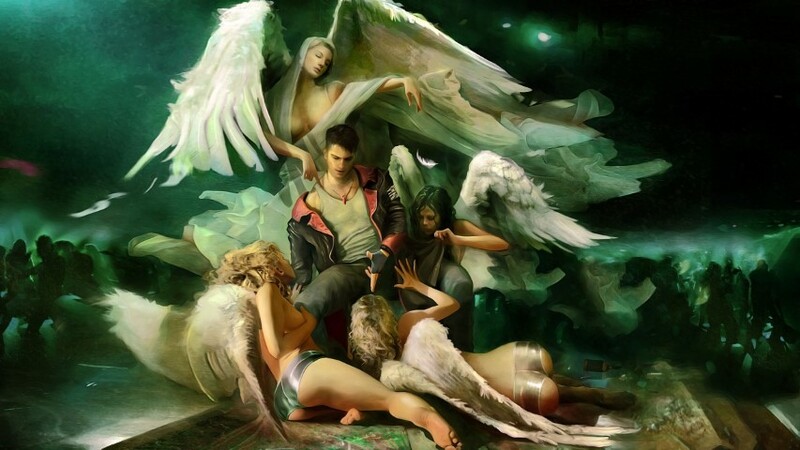 DMC offers a slick ranking system that is based on how well you cut down your enemies meaning if you just use one weapon against your enemies you’ll get the lowest ranking of ‘Dirty’. Master the combos and rack up your combo points using multiple weapons and you can get all the way up to ultimate level of SSSadistic. These combo points and rankings will stack up and by the time you reach the end of the level you’ll receive an overall ranking. This makes each level a lot more of a challenge if you are like me and must have the best. The fluid fighting system means you can take on an army of demons or just one. The controller is used perfectly and lets you use all the weapons at your disposal by pressing down either triggers rather than jumping in and out of options screens, and by golly are there some nice weapons here. 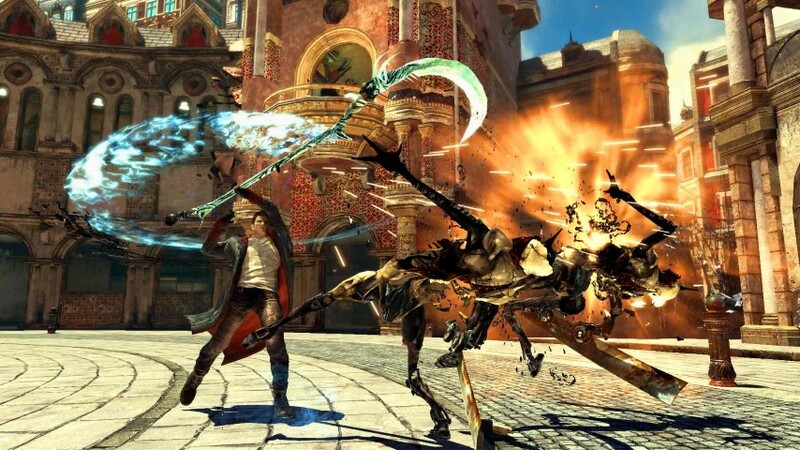 Unlike similar games like God Of War, DMC doesn't use "Quick time events" which have become slow and dated it actually lets you fight the boss using all the skills at your disposal! Something I loved. I always feel when having Quick Time events the game screws the player over and takes the controller away and makes the AI take over while you just sit back and watch a cut scene with the occasional button mash. I don’t want that rubbish, I wanna kick the bosses arse not watch the game do it after I press one button! Overall DMC is a great reboot, probably the best reboot that I can think of in game industry. I would compare it to the Batman Begins of the video game world. If you are after a great hack and slash or just some filler until the God of War comes out this is the game! 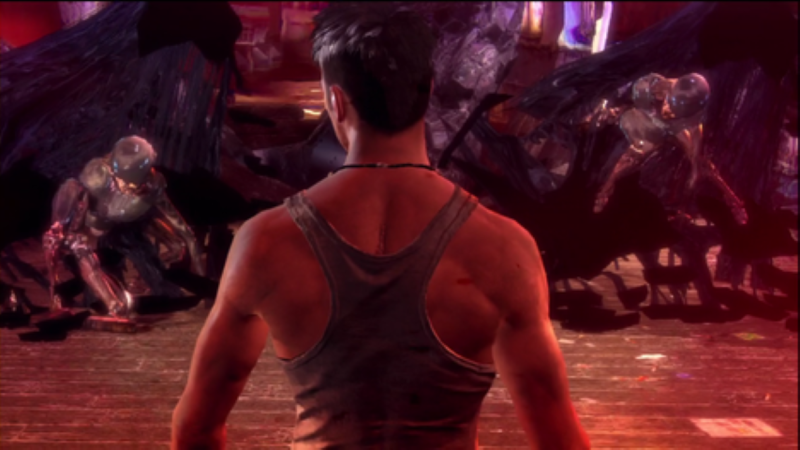 DMC is a hell of a lot of fun.